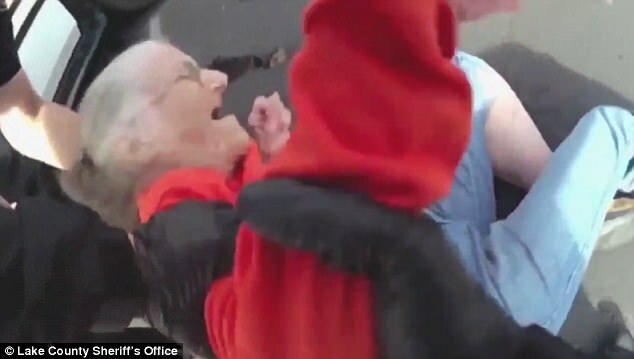 This is the shocking moment an OAP was forcibly removed from her home just days before her 94th birthday after she 'fell behind on rent'. Bodycam footage from one of the police officers shows them dragging Juanita Fitzgerald off to jail as she screams "you're hurting me" and "help!" The old woman shouts "ow" and "no" - and sounds like she's crying. Officers tell her to relax and insist they're not putting any pressure on her, insisting: "We tried to convince her." An officer is heard telling the pensioner "we don't want to hurt you" in a video of the incident in Eustis, Florida, US, on Tuesday. Fitzgerald is then seen being forced into a police car after her efforts to resist being evicted. She was taken to jail just a few days before her 94th birthday for refusing to leave the residence, according to Live Leak. The pensioner had been living at Franklin House, a retirement community, for eight years before reportedly falling behind on rent. She had apparently told police "unless you carry me out of here, I'm not going anywhere." Reports say police had attempted to avoid arresting her by offering help from various agencies and trying to connect her with family members but when she wouldn't co-operate she was arrested for trespassing. A spokeswoman for Franklin House told the Orlando Sentinel they'd spent months working with Fitzgerald and presented her with safe housing options. Fitzgerald was reportedly released from the Lake County jail by a judge and handed to a caregiver on Thursday, after two days locked up in a medical ward. She was spared having to spend her 94th birthday behind bars but reportedly faces charges of trespassing after a warning.